A good leather breastplate is not hard to find, especially not when you are looking at this Beaufort Breastplate. 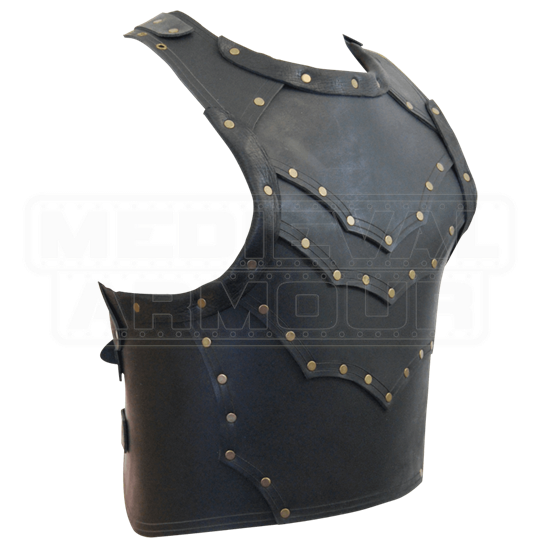 Simple yet striking, this armor perfectly combines medieval style and quality materials into an armor that looks great while keeping you safe. This breastplate is made almost entirely from 9-10 oz. leather, ensuring that it has a rugged and solid level of construction that allows it to hold up very well as LARP armor or a costume piece that will see rigorous use. The breastplate consists of several layers of leather plating that have been successively layered over one another, creating not only a rather defensible and protective piece of armor, but also one that features a great yet simple style that perfectly suits almost any type of warrior imaginable. The armor comes in two colors, either black or brown. It is also available in four sizes, and each size features a quartet of leather straps with two buckles around the lower back and one over each shoulder to provide a secure fit and a level of adjustability in each size. Good protection, it seems, is not quite so hard to find, so long as you know where to look and what to look for. And that means as long as you are looking at this Beaufort Breastplate, you have got good leather protection squarely in your sights.